Elisha Nelson "Eli" Manning (born January 3, 1981 in New Orleans, Louisiana, USA) is an American football quarterback for the New York Giants in the National Football League (NFL). Manning played college football at the University of Mississippi after attending high school at Isidore Newman School in New Orleans. When Manning entered the NFL Draft (which is where professional American football teams choose new players for their teams), he was first chosen by the San Diego Chargers. But, the same day that the San Diego Chargers chose Manning, they decided to allow him to play for the New York Giants. In return, the New York Giants allowed Philip Rivers to join the San Diego Chargers. The New York Giants also allowed the San Diego Chargers to choose more players the next time the NFL Draft happened. Manning was called the Most Valuable Player of Super Bowl XLII, which was played on February 3, 2008. In that game, he led the New York Giants to an unexpected win over the previously undedeated New England Patriots. When New York won Super Bowl XLVI, Manning was the MVP of that too. Eli Manning's home is in Hoboken, New Jersey. He is the son of former NFL quarterback Archie Manning. Eli is the younger brother of Peyton Manning. When Eli Manning was young, it was difficult for him to learn how to read. He almost had to do one year of school twice. Manning said that his mother helped him a lot when he was learning how to read. His brother, Peyton Manning, and father Archie Manning have also been successful quarterbacks. In 2007, Manning asked Abby McGrew to marry him. He met her while they were in college. On April 19, 2008 Manning and McGrew were married in San José del Cabo|San José del Cabo, Mexico. When he is not playing football, Manning likes collecting antiques with his mother and wife. On April 30, 2008, Eli Manning and the rest of the people who play for the New York Giants visited United States President George W. Bush at the White House for the Super Bowl champions celebration. Manning plays golf with his father and brothers several times a year. 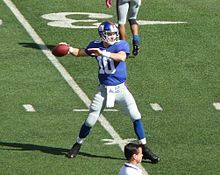 ↑ 1.0 1.1 "Eli Manning bio". www.jockbio.com. Retrieved 2007-11-01. ↑ "Eli Manning-PLAYERS-NFLPLAYERS.COM". NFL Players Association. Retrieved 2008-03-05. ↑ 3.0 3.1 Jerry Magee (September 21, 2005). "Nothing personal, San Diego; Eli Manning just didn't want to be a Charger". UNION-TRIBUNE. Retrieved 2008-02-09. ↑ Associated Press (February 7, 2008). "Patriots nearly perfect, but the Giants are Super Bowl champions". NFL.com. Retrieved 2008-03-08. ↑ Adam Sternbergh (Jan 27, 2008). "Underdog". New York Magazine. Retrieved 2008-02-09. ↑ KAREN CROUSE (January 29, 2008). "Eli Manning Took Cues From Mother". New York Times. Retrieved 2008-01-29. ↑ Stephen M. Silverman (March 22, 2007). "NY Giants' Eli Manning, Girlfriend Engaged". People Magazine. Retrieved 2008-01-22. ↑ "Eli Manning engaged to Abby McGrew". TransWorldNews. October 28, 2007. Retrieved 2008-01-22. ↑ Jo Piazza (April 19, 2008). "Giants' Eli Manning married in Mexico". New York Daily News. Retrieved 2008-04-20. ↑ Office of the Press Secretary (April 30, 2008). "President Bush Welcomes Super Bowl XLII Champion New York Giants to White House". The White House. Retrieved 2008-04-30. This page was last changed on 17 September 2018, at 00:50.